Dolce & Gabbana is a fairytale dream, brand of the irresistible charm, which is distinguished not only by the production of the highest quality, but also by the novelty and originality of ideas. The brand has been developing for years, for all that not losing its identity. The combination of modern daring design decisions with immutable traditions of the ancient Italian culture allows this brand to take the top place among all fashion brands. D&G clienteles are those men and women who enjoy their lives fully and completely and think of clothes as a way to express their own individuality and lifestyle. Nowadays Domenico Dolce and Stefano Gabbana are believed to be among the most impressive designers in the world, whose imagination for creation of breathtaking fashionable clothes, watches and eyewear has no borders. But they got that well-earned reputation not at once. It was preceded by the tenacious work, extensive efforts and of course inherent talent. Two future billionaires met back in 1980s when Domenico was hired in Stefano’s atelier. Gabbana was as good as a mentor to Dolce and once he came back from his compulsory military tour, the Sicilian design duo started their own consultancy. Eventually, this consultancy paved way for the promising fashion house named Dolce&Gabbana. For their first big fashion show they didn’t have enough money to hire professional models, that’s why the clothes were demonstrated by ordinary women who were their friends or acquaintances, but the show didn’t gain much success. Their runway debut happened in 1985 during the Milan Fashion Week. Labeled as ‘the boys’ for their youth and experience, the designer duo added a fresh flavour to the glamour statement of the fashion week and ended up registering their mark on the global fashion map. 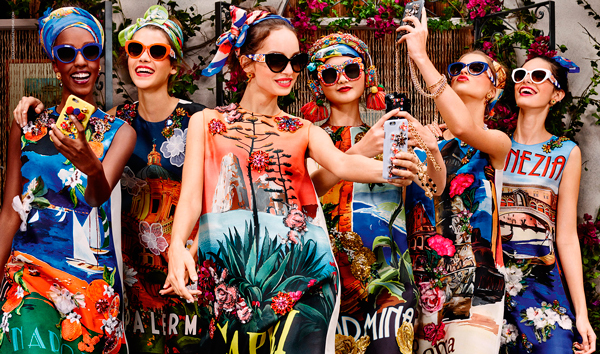 Soon, Dolce & Gabbana grew in terms of presence and popularity. One by one appeared new boutiques and unique collections the world has never seen before. Today, the fashion duo has become popular not only in Milan, but it also won the hearts of fashion connoisseurs in Tokyo, New York and soon through all over the world. Dolce & Gabbana succeeded in introducing its admiring fashion to the world not just through its apparels and accessories but through books, films as well as music. In 1996 the brand launched its first CD called ‘D&G Music’, and in 1998 appeared ‘Mémoire de la Mode’, a book dedicated to the story of one of the most successful fashion brands in the history. The ace designers are like fountainheads of creativity that never restricted themselves in order to help their fashion They never limited themselves to help their brand thrive. Dolce & Gabbana’s expertise extends beyond the classy apparels that they have designed. The stylish designers have also established their expertise in designing magnificent accessories, fragrances and not to forget eyewear as well. In fact they have also lent their sterling craftsmanship to the world of automobiles with the limited edition of fashionable cars together introduced in association with Citroën. Dolce & Gabbana creates best things for the most well-known people. Madonna, Adam Lambert, Naomi Campbell, Kate Middleton, Keira Knightley and Kylie Minogue are amongst the many who are patrons of the brand for it’s unique ideas and superior taste in fashion. As a further commitment to the world of sport, the brand made a special uniform for A. C. Milan football team. In fact, Lionel Messi who is appreciated as the best football-player on the scene currently, has recently begun endorsing this Italian fashion brand. Dolce & Gabbana introduced their idea of sensuality and aesthetics to the domain of eyewear designs as well. Each model is carefully crafted representing excellence on all fronts creativity, design and craftsmanship. However, we will mention a few master pieces from their extensive portfolio. The Dolce&Gabbana Autumn-Winter 2015/16 collection called ‘Mama’s Brocade Collection’, consists of some pretty models embellished with tiny red roses and beautiful golden brooches with grey pearls seems and is indeed empyreal in every sense. You will be thrilled, astonished and speechless, because such pure beauty affects everyone. The fact that there are only 500 pieces of this limited edition in the world emphasises its uniqueness even more. Another model of this collection, DG4267, is a bright evidence of the fact that an irreproachable style can be created only when the traditions meet with the attention to the details. Its flowering laced frame will remind you of a blooming ease of youth and keep inexpressible warmth and cosiness within your heart. Cat-eyed shape in combination with chamomiles makes the eyewear definitely worth wearing. It will inspire you to love and to be loved for sure. The more recent names to mention in this category is the Sicilian Carretto Collection. Inspired by the Sicilian art, the use of bright colours and exquisite designs make the eyewear in this collection a priced possession for any fashion connoisseur. Other stalwarts in this seasonal collection include Margherite and Agrumi. The eyewear models in the Margherite Collection carefully encapsulate the creativity of the brand in the form of impressive designs. The models in this category are inspired by the colourful floral spreads in the nature. For the Agrumi Collection, the designers take inspiration from Southern Italian countryside where the landscape is decorated with grooves of lemon and orange trees. There are many more eyewear models in this category that continue to get into the limelight from time to time. Indeed, the two ace designers proudly flaunt their Italian character in every design that they create and their best is yet to come.